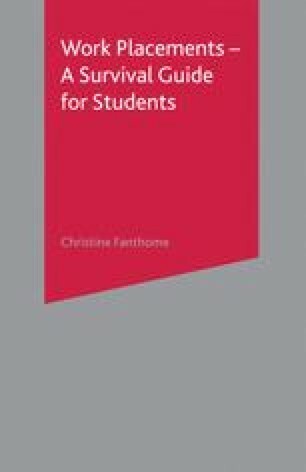 The greater part of this book focuses on the experience of work placements from the point of view of the student. However, in order for students to have a complete understanding of the overall process and the various influences affecting each stage, it is useful to consider the opinions of the other relevant parties. It is very important for students to be aware of the employer’s motivation and point of view since many problems with work placements stem from a mismatch of aims and expectations between students and employers. If students understand both what it is that employers want and the reasons behind any reservations employers may have, they are in a better position to overcome or avoid difficulties. Similarly, an understanding of the tutor’s perspective enables the student to develop a relationship that works to maximum mutual advantage.